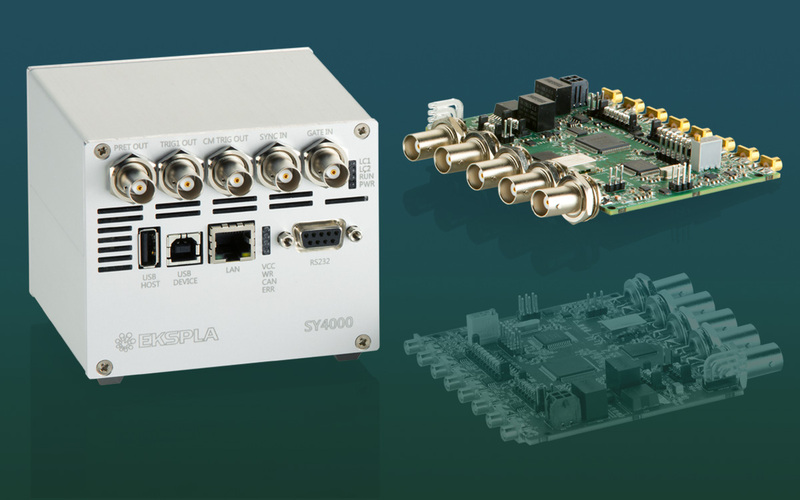 Ekspla introduces a new pulse synchronization module with delay generator. The SY4000 series module is designed to create up to 8 delayed output pulse sequences precisely synchronized to an internal or external clock. A photodetector or electrical signal can be used as the input source to be synchronized. The SY4000 delivers precise delay control from 2 ns to 150 ms, maintaining 25 ps timing resolution. SY4000 pulse delay generator gives the possibility to create different sequences, such as a delayed trigger or timed series. These features are employed in applications like creating sets of pulses to control Pockel’s cell drivers with one, two, or 4 triggering inputs. The SY4000 laser synchronization module is available in two versions, an OEM version and an encased version. The OEM version features a compact, single-board solution optimized for installation in user’s equipment. The encased version is an ideal solution for lab and/or evaluation use before switching to the OEM version. In addition, to preserve all specifications as the SY4000 OEM, almost all of the most popular communication ports (RS232, USB, LAN and WLAN) were added to the SY4000 encased version. The encased SY4000 features universal powering from 90 … 264 V AC / 50 – 60 Hz or 12 V DC, which allows for a low cost and easily integrated solution.